If you’re joining me for the first time, this is Part 2 of a short series in which I curate the best of the best lettering resources for beginners. See Part 1 here: The Basic Strokes. I know you’re busy; I’m busy, too. But I promise it is so worth it to have a creative outlet to escape from that busy lifestyle, if only for ten minutes. In this series, I will provide no more than 5 resources that you can consume at work, at home, or anywhere in between. Let your new hobby begin! This is a pretty long video, but an informative one. It shows you how to build a lowercase letter from the basic strokes. If you’re practicing at work or while the baby is sleeping, you could put this video on mute and start at 1:37. Take note of the building blocks of each letter, then see how she lefts her pen/pauses between each stroke in order to perfect the letter. I’ve already said it once: I love lettering with fat Crayola markers. 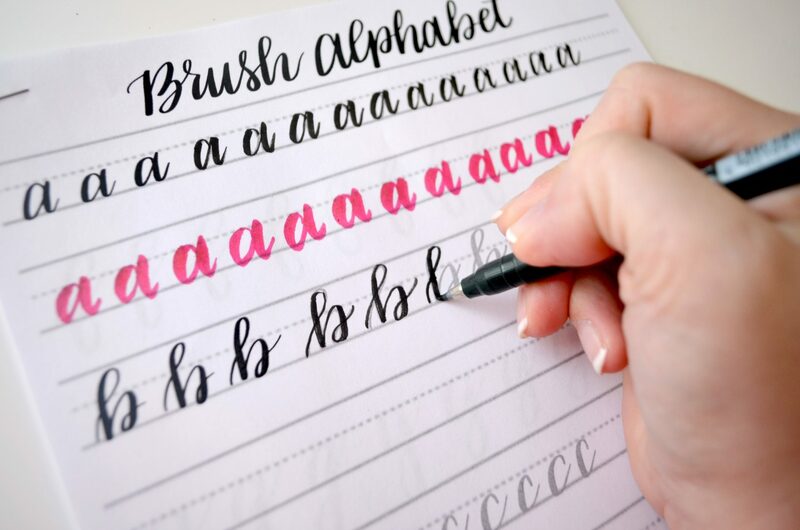 I think they’re the best beginner calligraphy tool–as well as my preferred “brush” lettering tool. This video is much shorter than the Loveleigh Loops one, but it doesn’t break down the letter by basic strokes. This is a good one for those of you who just want a fast(er) overview of lettering each of the lowercase letters. Stephen’s lettering style is a bit different from modern calligraphy, but some of you may like to try it. This style is like when calligraphy meets graffiti. I love it! There are a ton of lettering practice sheets and workbooks that you can buy through artists’ websites and Etsy stores. I wanted to find something free, though. On this page, you can print off free practice sheets and letter directly on the page, or use tracing paper to letter over the page. Disclaimer: The sheets that you can purchase have more information about the motions of lettering, and how to go about drawing each letter. With this free one, you’ve got to be aware of how the basic strokes fit in yourself. Resource #5: My Stories @nerdladydraws! Check out my featured Instagram stories @nerdladydraws for quick videos on how to letter each of the lowercase letters with the basic strokes. Each video is short and muted so that you can follow at work or while your kid is sleeping! That’s it! Now go practice lettering! Let me know how you’re doing by commenting below or finding me on Instagram @nerdladydraws!